These elegant fall wedding invitations feature pressed foil leaves on a rustic kraft background. The foil color is rose gold. The typography color is white. There are also other color options for this design but the Kraft option is the most rustic looking. Kraft – Rose gold foil leaves on kraft background with white typography. Gold – Gold foil leaves on a white background with black typography. Rose Gold – Rose Gold foil leaves on a white background with black typography. Silver – Silver foil leaves on a white background with black typography. Sea Mist – Silver foil leaves on a light aqua background with gray typography. Trim Options: There are a number of trim options for these invitations: Rounded corners and Waved, Classic or Curved frames. Back Options: The back of the invitations are white. Additional options for the back: leaf pattern, flat color, additional text or photos. Envelope: A white envelope is included. Additional options for the envelope include wrap around return address labels and envelope liners. Your guest’s addresses can be printed directly onto the envelopes. 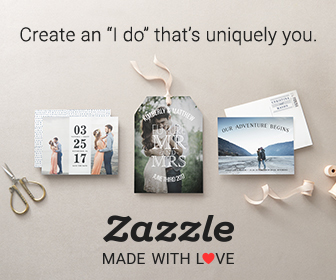 Matching Items In This Suite: thank you cards, personalized postage stamps, place cards, table numbers, ceremony programs, menus, reply cards, reception cards, direction cards and a wedding website. I really like the foiled leaves in this design. They look amazing against the background. 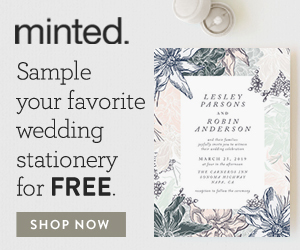 Even though the design is rustic, it looks glamorous at the same time and gives your wedding stationery an extra special element. I also like that a full suite is offered so that you can carry this beautiful design through your whole event. These elegant fall wedding invitations have been designed by Angela Thompson.